When I first stepped inside Saginaw High School, I could feel a palpable sense of resiliency and community pride that runs deep in this mid-Michigan town. The smallest of the state’s three key historic automobile producing communities, Saginaw – like Flint and Detroit – is reinventing itself for the Information Age. I was brought to Saginaw as the guest of State Board of Education member Pamela Pugh. Pam is a proud graduate of Saginaw High, and her support of the community was immediately evidenced by the warm welcome she received from students, teachers and principal Janice Davis. More than an alumna, Pam is an advocate and ally for students, teachers and community members who all work together to maintain meaningful and relevant programs that make a difference. 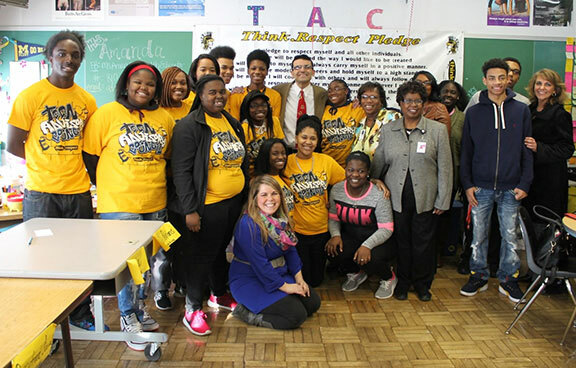 I was first introduced to a remarkable group of student leaders, the Teen Advisory Council. The TAC runs a variety of events throughout the year, ranging from fundraisers to battle breast cancer to mental health awareness events designed to end stigma and promote discussion. I shared my own mental health journey as a person living with bipolar disorder, and applauded these dynamic teens’ efforts to promote dialogue and understanding. I was particularly impressed when we stood and recited the Think Respect Pledge, a student-written statement that promotes a safe and supportive school environment. After meeting student council members, I was able to visit the Saginaw High Health Center, a clinic housed in the school that is open to both students and the general public. With a background in public health, Pam understands the interrelatedness of wraparound care and academic achievement. I was taken by the fact that after the clinic first opened, the attendance rate among students at SHS increased 33 percent, evidence of the critical role that primary and preventative health care play in ensuring academic readiness. The clinic was colorful and inviting, with inspiring quotes and art adorning the walls. The staff was outgoing and most welcoming. I had a sense that they deeply valued the critical role this clinic played in the overall health of both the school and the larger community. I then met with a dedicated group of servant leaders, the SHS LINKS volunteers. These students work each day serving as peer-mentors and guides for classmates who are on the autistic spectrum. I listened intently as the LINKS team members described the practical ways they help their classmates negotiate social situations, attend more effectively to academic activities and feel more integrated into the school community. They are truly doing lifesaving work on a daily basis. I was moved by their deep commitment to support kids with special needs. I next had the pleasure of visiting Carrollton Middle School, where Principal Marc McKenzie brought me to an eighth grade language arts class. I was impressed by the welcoming atmosphere and spirit of diversity and inclusion that was evidenced in the school’s culture. I asked the students to think about things they appreciated about their school and what they would do to make it even better. What kids valued most was the way the teachers at Carrollton took a personal interest in them not just as students, but as human beings. They felt nurtured, supported, and cared for by a truly dedicated, hard-working staff. As we were driving from Saginaw High School to Carrollton Middle School, I saw a sign on the side of a building that conveyed the sense of determination, resilience and can-do spirit that encapsulated my visit perfectly. In bold, block letters, one word: Saginawesome! The Teen Advisory Council creates positive change every day. LINKS program members support people on the autism spectrum daily. The "Junkyard Wonders" spirit of celebrating the genius of every child is alive and well at Carrollton Middle School. Rick Joseph is Michigan’s Teacher of the Year for 2015-16. He’s a fifth/sixth grade teacher at Birmingham Covington School and has more than 20 years of classroom experience. He is also a first-place award winner at the 2012 Microsoft Global Forum for Expert Educators, which was held in Prague.